The tachometer is an essential instrument for measuring the rotating speed and troubleshooting of machinery performance. The device can also be called the speedometer and is used to read the speed of a disk or shaft in motors or other rotational machinery. The tachometer usually shows the RPM (revolutions per minute) on a digital screen or a calibrated analog display. Some tachometers have built shift lights which can be used to enhance racing performance. Neiko is a manufacturing company that produces tachometer for cars, turbines, fans, and other rotational machinery. Neiko is known for supplying high-quality products that offer high performance at an affordable price. The company’s tachometer is built to measure accurately the speed of your motors, production line checks, gear movement and engagement, and also the speed of propellers and fans, RPM of rollers, monitoring turbines, spindle motion and quality control. The company manufactures both contact and non-contact tachometers, the contact device has a rotational head while the non-contact has a laser beam that gives a more accurate and precise reading than the contact tachometer. The device can record from a distance up to 20 inches and more. 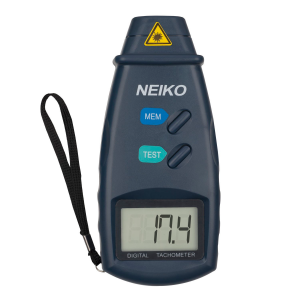 The Neiko 20713A digital tachometer is a measuring instrument that offers the latest technology. The equipment is a non-contact device that accurately measures rotational speeds through a precise beam or ray of light together with reflective tape (included in the package). This device is vital in carrying out day to day operations and maintenance of mechanical systems and also serves as a benefit for developmental laboratories and research institute. The Neiko 20713A non-contact tachometer is highly efficient, and it’s made from high performing material. The device provides high safety performance with an inbuilt internal memory that recalls minimum and maximum values that have been previously stored. This non-contact tachometer device has been made for fast and accurate measurements. The Neiko 20713A product is portable to carry around and comes with a large LCD screen. It can save up to 15 previous readings, including the minimum and maximum, and the last test result values for ease of data recall. Neiko 20713A Digital provides an accurate reading, and it’s easy to use for measurements and diagnostic tests. The measuring device comes with a 3 AA battery, reflective tape, cushioned stored case and 2-inch reflective tape. The digital tachnometer has speed power and instant reading. The Neiko tachnometer is the best available product on the market. With an average 4.1 customer star rating, the tachnometer stands out among other competitors. Without a doubt, the Neiko 20713a is the best available tachometers on the market today. The instrument comes with an inbuilt memory and battery that can withstand any harsh environment during usage. The tachometer or speedometer was manufactured with the best quality performing material and can be used to update drivers the state of their cars and provide accurate information which can benefit them from obtaining the best performance from their vehicles. Speeding without knowing when to change your gear can damage your equipment, the Neiko 20173A tachometer ensures you have the best information when using your car or other rotational instruments.